They'll Think You've Gone Professional! 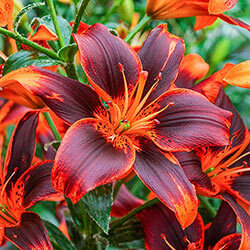 Go bold with three of our latest Asiatic lily varieties—three cultivars with outstanding colors and forms! 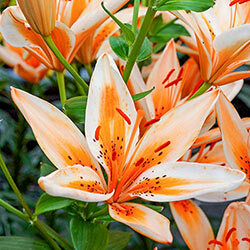 This collection proves why Asiatic lilies are such a brilliant choice for the garden. 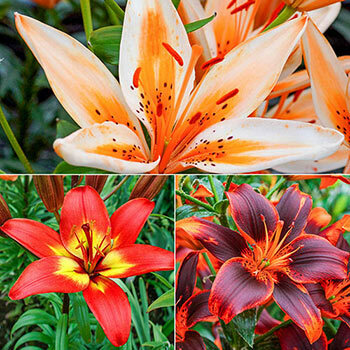 They are intensely showy—Forever Linda and Forever Susan have sizzling new color combinations, Orange Electric's flower form is beautiful—which is sure to impress the neighbors. 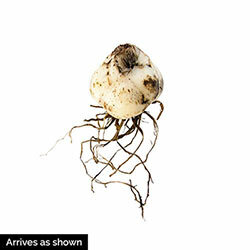 However, success is surprisingly easy—they are sturdy, carefree and very cold hardy. 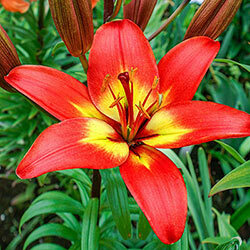 They're fabulous at perennializing too, so you're not just planting for a beautiful summer this year! You can watch them revisit in coming years with even greater vigor. We suggest bringing some blooms indoor—these are glorious in arrangements.